If someone were talking about you, would you want to know what they were saying? For businesses, there’s no choice—they need to know what people are saying about their brand. It’s important for brands to listen carefully to what is being said about their business—and even more important to know whether the talk is positive or negative. Sentiment analysis tools can help with this. We spoke to Nick Martin, social engagement coordinator at Hootsuite, about why is important and what tools he uses on a daily basis. What is social media sentiment? While you might be feeling great about the 10,000 mentions your brand got on Twitter last week, you’re in trouble if these are complaints. You can determine the state of your social media strategy by analyzing social media sentiment. Tracking sentiment helps you understand what the individual behind a social media post is feeling. Knowing the emotion behind a post can provide important context for how you proceed and respond. Why is social media sentiment important? Marketers benefit from having as much information about their audience as possible. Understanding your audience’s reactions to your posts helps you plan strategically for future campaigns and content. Say, for example, your social media team is running a campaign about your brand’s new body wash, which features microbeads as scrubbing agents. After the launch of the new body wash, your social team notices the majority of conversations are negative due to the environmental impact of microbeads. “Through monitoring sentiment, you’re able to analyze the negative reaction to the product and hear straight from customers,” Martin explains. In the example above, the brand can take action (such as revoking the product from the shelves, making a public donation to a recognized environmental organization, etc.) and adjust messaging accordingly. If there was a large outcry in response to the product, monitoring sentiment also helps the brand refrain from sharing any tone-deaf social media posts. The situation above could have been avoided if the brand had tested for sentiment prior to launching their new product. Monitoring sentiment allows brands to conduct simple market research before going further with new products, services, or features. Monitoring sentiment is a beneficial tactic for customer service and support representatives. This serves another purpose too—you have a unique chance to turn a bad customer experience into a positive one. Public relations and corporate communications professionals need to be aware of brand perception. Part of a PR professional’s job is to ensure the message they’re sharing is relevant and targeted. Using sentiment analysis, they can take the temperature of their target audience before sending out any message. Sentiment analysis is also helpful when monitoring keywords for PR professionals. In addition to seeing what the general public has to say, they can find influencers and thought leaders having conversations about their brand. Using sentiment analysis tools, PR pros can see the influencers having positive discussions about their brand, and use this information to build relationships. When using a sentiment analysis tool such as Hootsuite Insights, PR professionals can watch for when conversations surrounding their brand turn negative. The tool will recognize an unusual spike in the volume of conversations—and measure tone. While vanity metrics such as follower count and likes are easily tracked, measuring tone and sentiment can be trickier. The following tools can help. It will come as no surprise that Martin’s sentiment analysis tool of choice is Hootsuite Insights. Users can quickly and easily filter mentions and sort by sentiment. Users can also track sentiment by keywords and set up automated assignments by chosen keywords. For example, Martin sets up his Twitter mentions on Hootsuite to scan for Tweets containing positive terms such as ‘thank you,’ ‘love,’ and ‘amazing.’ He also makes sure to search for sentiment-indicating emojis, such as the thumbs up or smiley face. 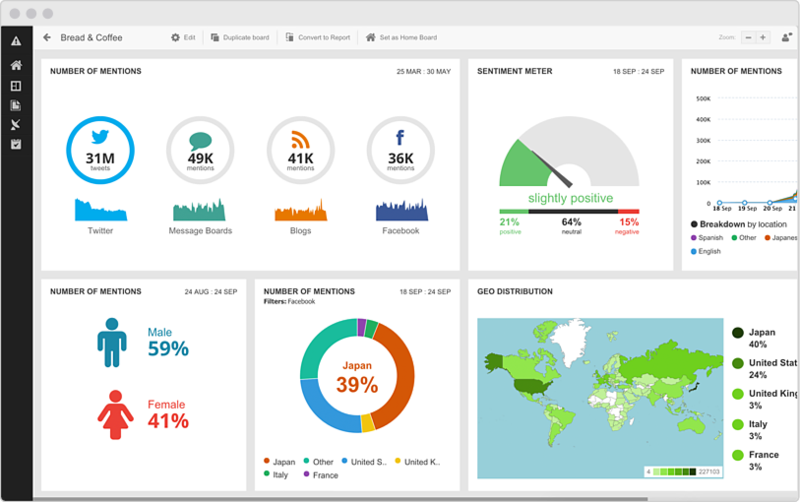 Hootsuite Insights provides an overview of sentiment with an easy-to-read meter. This allows you to quickly see how your brand is doing from a sentiment point of view, and monitor for any changes. Twitter Advanced Search is a free online tool that helps you find Tweets based on sentiment. To use Twitter Advanced Search as a sentiment analysis tool, enter your desired keyword and check the positive or negative box. Keywords you might want to start with include your brand’s name and product names, misspellings of your brand and product names, and your CEO’s name. Brandwatch gives users access to insights and data from over 70 million traffic sources. Along with engagement and monitoring capabilities, you can quickly monitor the tone of posts and data being scanned. This allows you to analyze how certain content performs, and the types of reactions it receives. Semantria’s Lexalytics adds another layer to sentiment analysis. The tool recognizes the importance of every word in a sentence, and evaluates the sentiment based on this. Rather than evaluating each mention of your selected keyword on its own, Semantria looks at context of the post against related content, and compares results. Rapidminer uses a specialty text mining approach to help brands conduct sentiment analysis. With Rapidminer, unstructured content sources, such as online reviews and social media posts, are analyzed, along with structured sources such as official publications and documents. This allows you to identify areas for business growth, trends amongst your customers and consumers, and gather feedback from your product launches. The more data you have about your audience and industry, the better chance of success you have. Using sentiment analysis tools allows you to evaluate the attitudes of your target consumers—attitudes that can make or break your brand’s reputation.